DOLLING UP HALLOWEEN. THIS YEAR’S CREEPY DIY. I don’t like dolls. Anyone who knows me knows that I hate dolls. They’re gross. And scary. Like clowns. As a young girl, formulating my likes and dislikes, dolls very clearly fell into the dislikes group. Because of that, instead of playing with dolls, I would dismember them and throw them under my bed. Feeling empowered, I’d then run outside, find the nearest worm and claim him as my plaything. I didn’t do dolls. However, in a strange turn of events, I now love dolls *on one condition. * That they’re obviously terrifying. Antique, creepy, dirty looking dolls bring me the kind of joy I normally only get from finding leftover pizza in the fridge I’d forgotten about. So a month ago when I was planning this year’s Halloween DIY I knew I had to use dolls. They are the perfect combination of grotesque and terrifying. Am I right? 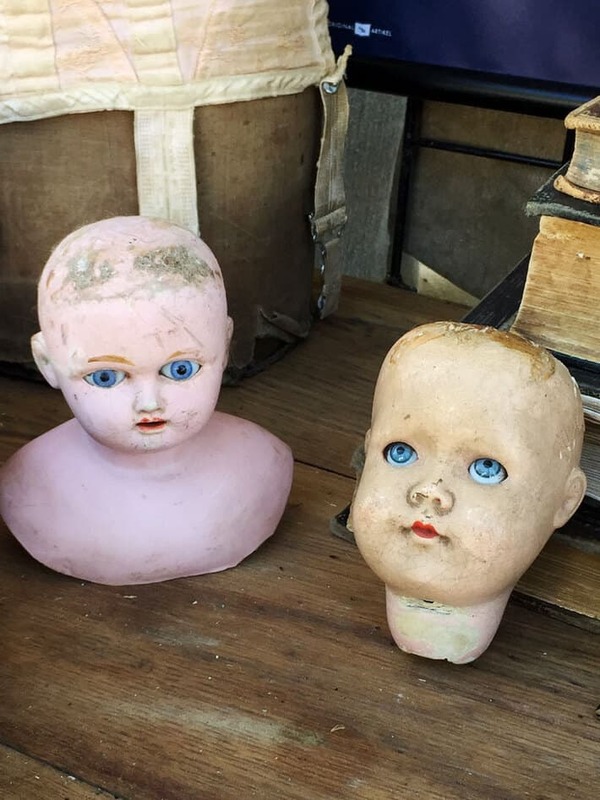 In fact you’ve already seen one of my prize dolls heads in this Christie Antique Show post I did last month. It’s the one on the right, below. I didn’t buy the head at that show, but saw it again at a show the next weekend and picked it up then. As luck would have it, after digging around a bit, the vendor was able to find the arms and legs and also donated the torso. It was at that exact moment this year’s Halloween DIY was born. The following simple DIY may be disturbing to some readers. And I’m O.K. with that. 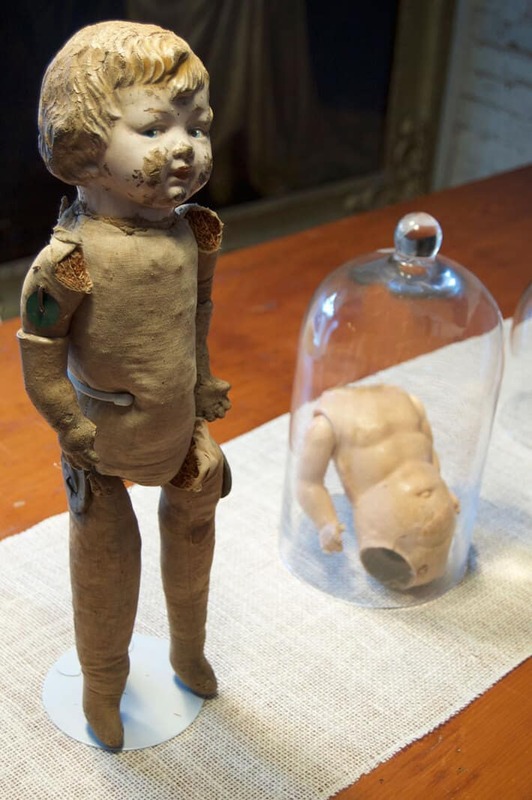 Doll parts under glass. I know. It’s disturbing. That’s what makes it great. The dolls and doll parts were all bought at local flea markets or antique shows; the most expensive one being $20. If you don’t have access to flea markets the best place to find vintage dolls or doll parts is Etsy. If you click here you can see what they have right now. The glass cloches (other than the huge one in the centre) were all bought over the years at Homesense. That’s Homegoods to you American folks. 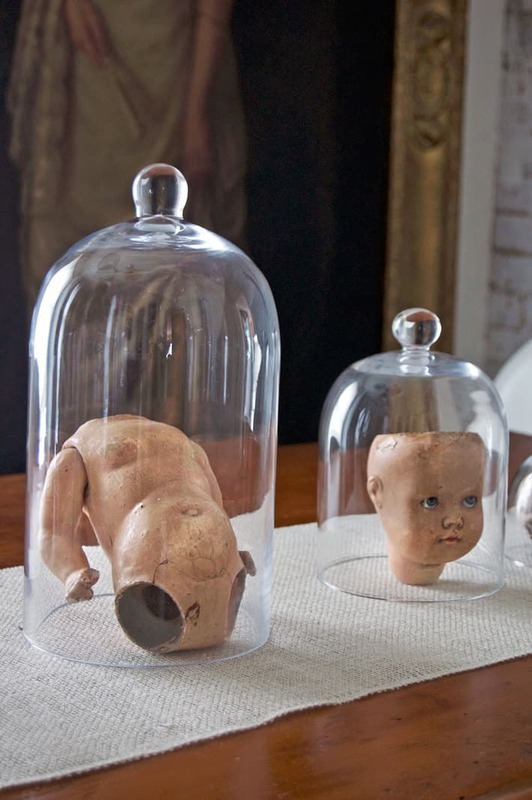 Rule number one in any kind of decorating, grotesque or not, put something under glass and it’ll look special. No. Matter. What. Even a dirty old hand looks remarkable under glass. The dolls legs are particularly gross. In other words, fantastic. EVERYTHING LOOKS BETTER UNDER A GLASS CLOCHE. This full, straw stuffed doll cost me $20 at a flea market. The vendor had $45 on it but as I was looking at it he must have been so thrilled someone was interested that he dropped the price immediately to $20. SOLD. I’ll be keeping this out in various places of the house throughout the year. I mean, you don’t keep something as stunning as this hiding in a Tupperware bin in the basement. You just don’t. 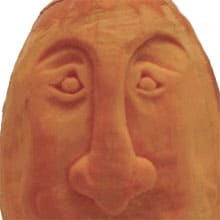 This is the head that started it all. The head without a body, until the vendor found the body in pieces for me. There’s a certain elegance to displaying all of these body parts under glass like specimens. It’s the kind of elegance a worm would be hard pressed to ever achieve. I mean unless you put a top hat on him. Next Monday I’m going to give you this year’s full Halloween house tour. It will be in keeping with how I’ve always approached Halloween decorating. It should be creepy but with something weirdly pretty about it too. It should be Pretty Grimm. The Most Beautiful Baby in the World! Turned into a Halloween Craft. I love your creepy dolls! I have some I need my Halloween bins, but as of yet didn’t know what to do with them. Now to dig out the cloches! I LOVE Halloween, even more than Christmas. Dang, Iove you, Karen. Have followed you for years, and love everything you do and admire you, but I can’t get into this. Maybe cuz I’m getting older (?) But I honestly think even when younger it wouldn’t have been my decorating style. To each their own! Ha ha! This is definitely for a certain sector of society, lol. NOT for everyone. 😉 ~ karen! lol..happy halloween! I love it, just not this. Some of us love these creepy dolls all year round.I have doll parts all around the house.Sometimes the legs stick out of houseplants.Arms on a light pull string.It’s all good.Welcome to the club,Karen. They are awesome! What a great idea. Reminds me of the creepy boy in Toy Story. Excellent! I may do the same. 😉 ~ karen! 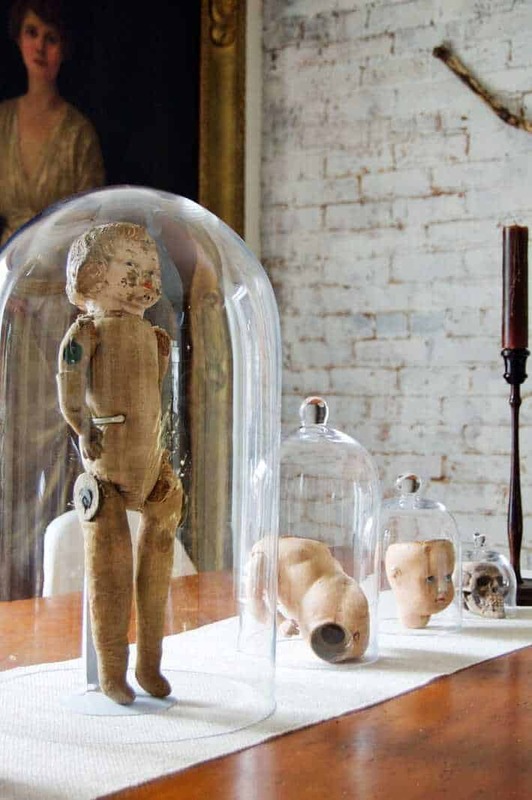 Love the dolls under glass. Hell no never ever ever – don’t do Halloween (but then it is not big in sunny SA). I hate all things that give me the heebie jeebies!! Love it! Incredibly creative and one of a kind creepiness! I LOVE this! I LOVE Halloween. I love the doll-head-that-started-it-all and her angelic expression in the first photo. 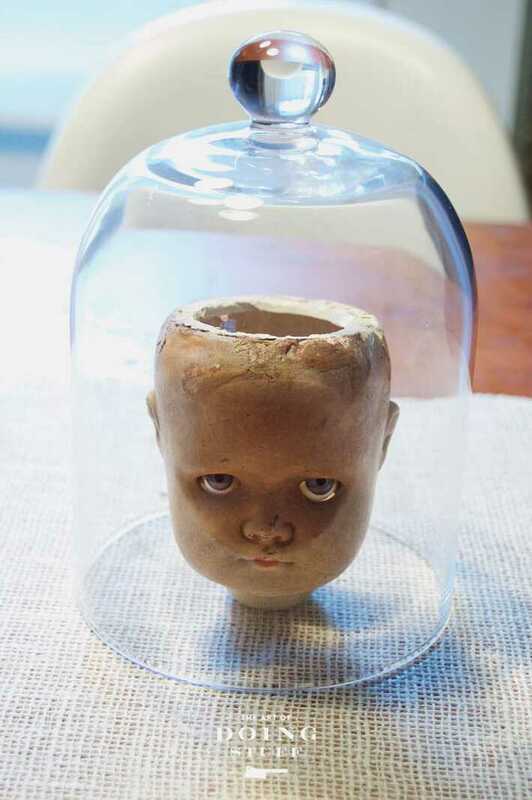 Then at the end, under glass, she looks slightly like a teenage girl rolling her eyes at you! “Are you serious, Mom?” I have several old hair-cutting mannequin heads out in the front yard in my cemetary, and now I want a giant cloche for one of them for work! A friend took one, sawed the top off, to perfectly fit a bowl for guacamole and put it on a platter with chips around it! It was a thing of beauty! I love all of this. Hi Karen, I am from Hyderabad, India, and your Halloween post was brilliant. Which gave me inspiration. We have a weekly city flea market called the Jumerath bazar (Thursday, in Urdu) and it’s been going strong for a hundred years at least. (see this video) You can buy anything from keyboards without 20% of its keys, cracked picture frames, alarm clocks without hands, old tooth brushes (seriously). So next Thursday I will be there at 6 am (it opens early!) to look for things I can use creatively. I’v seen way too many horror movies, and I would have to avoid my dining room if I had a display like this. Just waiting for the eyes to BLINK! No! No! No! No! Horrible! You can safely say I don’t like it. The added bonus being that you only need to buy enough treats for NEW trick or treaters… Because you would never have repeat customers! Karen you did it AGAIN!!!!!!! Luv it all AND I love horror movies and creepy TV shows since I was a child. To Peter Woodman: what fun that must be, I live in Lisbon and Feira da Ladra is full of old stuff the creepier the better hahahahaha! and yup! Me too! Every year when it’s time to put away the Halloween decos, I keep just a few more out. Making my home decor style something like… traditional rustic haunted house. Lol. Great stuff! Love it! I bet you will enjoy these. My beloved sister is 6 yrs older than me (we are both sooo old!). I used to chase her with earthworms. She would always be calling out to our Mom- “Mommy-make her stop!” Now that I think of it-I do not remember my mom ever stopping me. Guess she also knew Carole was a sissy! Since so many of your adoring readers are grossed out by the dolls “under glass”, It means you did indeed score big here. Well done! BTW- I NEVER played with dolls. Remember the year you had holiday gift ideas? I still sort of regret not buying myself and you a baby doll head mug in white or black. That mug still haunts me. 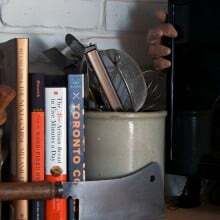 oh, I saw a mug like that once, very creepy, in a fun, weird way. I forgot about those! Maybe they’re still available? ~ karen! Fabulous, darling, fab-u-lous! I LOVE it! Love it! I have a bunch of doll parts but put mine into a leafy wreath with spiders scattered about. My own “body farm” Halloween wreath! OK now Karen – you even managed to make beautiful Margaret (Karen’s large painting to people not in the know) look ghoulish. To me she now looks like she’s longing for her long lost “babies under glass”. Just look at her staring at them ….. poor Margaret! Ha!! I didn’t even think of that, lol. ~ karen! Brilliant idea. The skeleton head cracked me up. Habahahahahahahah. You are twisted Sista ! But I love it. little hand hitting the side of the cloche, or the shattering of glass on a hardwood floor, you have only YOURSELF to blame. Creepy! That creepy little guy whose eyes are squinting and following your every move seems to have given you a thumbs up! My eyes went to the tallest standing doll on your table and finally I noticed the others – I laughed out loud. YES it’s creepy. But so Karen! It is definitely worth leaving up well after Boo Day. On another note – my daughter spent 3 weeks in China and during one of her tours of a monastery, she was trying to find a garbage can and it took time to get him to understand. Finally, he got it and took the empty can from her then she smiled and gave him a thumbs up. BIG mistake! The tour guide grabbed her hand and whispered – thumbs up here means he is well hung. Polly was mortified as was the monk. Live and learn. the eyes on the dollhead are great………..what an expression. I’m sure she knows something and is not telling. This might be my absolute favorite decoration that I’ve seen you do yet!! Love it! When they’re under the glass it’s like you’re protecting something very special, and because they are what they are – it’s fantastically creepy!!! This is a fantastic idea for Halloween, love it! Novel idea! 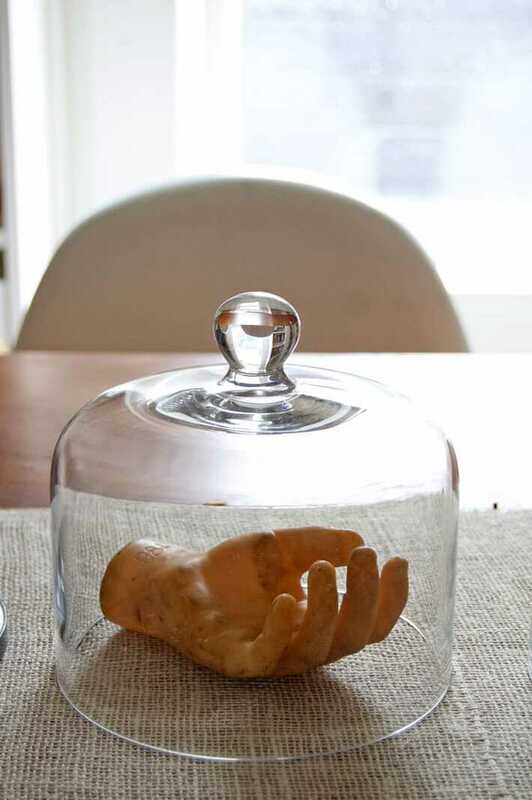 I am especially found of the hand under glass. Maybe this is therapeutic. After all, we need to express our inner creepiness!! 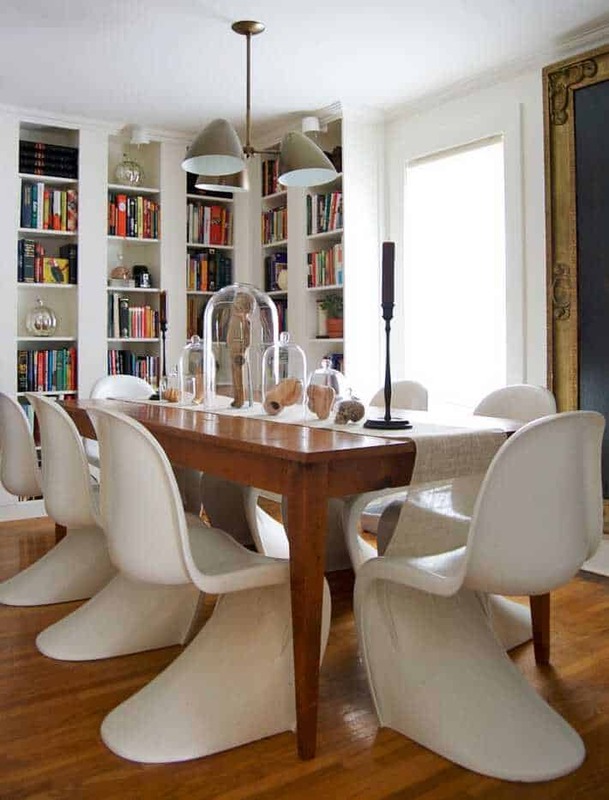 Seriously, what a creative way to repurpose, and also, make great party decor. This is beyond creepy and way past disturbing! Lifelike dolls in any state scare the bejesus out of me ever since I saw the doll scene in Barbarella. At least these are under glass where they cannot bite anyone. Seeing this though makes me wonder exactly what you store in that tardis/bookcase of yours. Karen, that’s so grotesque. I love it. love Halloween ! can’t wait to see your tour..
Karen, you should look up the old Trilogy of Terror movie that ran on tv back in the 70s. The Karen Black segment with the doll traumatized my whole generation. Scared the holy living hell out of me! This may be my fave post yet! Why have I been wasting my time buying cheap plastic skeletons, skull heads and hands when I could have been collecting these! Thanks for the delightfully disturbing inspiration! 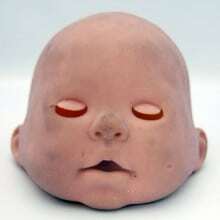 I’d be so tempted to put a bouquet of violets in the baby doll’s head to give her something to think about. My friend goes a bit further. He takes a blow torch to the dolls. Way better use of dolls than somehow pretending they’re pretty and such. And now I feel empowered to finally do the weird plastic doll dismemberment that I’ve had in the back of my head since I found the thing at a flea market…planter with plant pouring out of belly….bwahahahhhhaaa……. Karen- I am not a halloween fan. But, if I was, this would be the kind of decor I’d use. Great stuff! I have to tell you, this made me sick. Really. I gagged. I really enjoy you and your blog, however, this is a little over the top for me. I know, to each his own. My grandson just walked in, saw the screen and screamed. Not good. Did you slip the skull in there just to see if we were paying attention? Love it!! 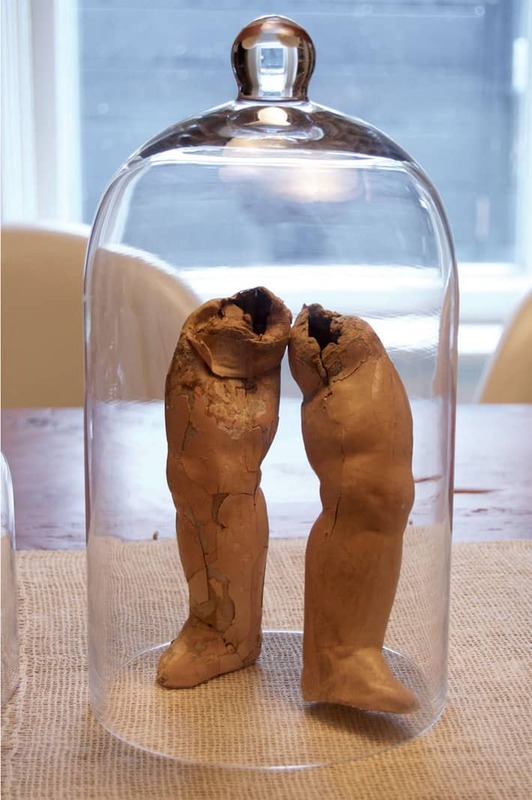 Have to say though, I instantly thought of the fabulous movie “Margaret’s Museum” (http://www.imdb.com/title/tt0113774/) when I saw the picture showing the full collection of body parts under glass on your dining room table (with Margaret looking on). I have never heard of Margaret’s Museum, but it works perfectly with my actual Margaret painting looming over it all. ~ karen! Straw Doll is throwing some serious shade. Love her! You just solve my biggest problem with setting up displays. Anything I put out that’s not heavy enough gets knocked down by the cats, including cut flowers…put a cloche over it and voilà! Need to find cloches now.